At a time when gold and diamond jewellery exports declined significantly due to weak global demand, shipments of silver jewellery have shot up over the last few years following big investments by local jewellers in technology to produce world-class ornaments. 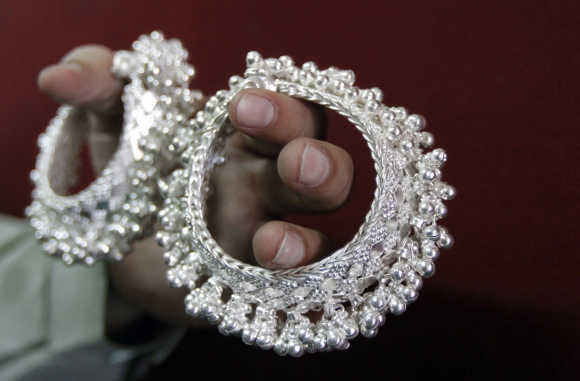 Data compiled by the Gems & Jewellery Export Promotion Council showed India’s silver jewellery exports rose 55 per cent to $523.13 million in the April-June quarter of 2015 from $337.46 million in the same quarter of the previous year. By contrast, exports of gold jewellery fell 23.13 per cent to $1153 million in the April-June quarter this year from $1,500.02 million in the corresponding quarter of 2014. Similarly, exports of cut and polished diamonds fell 7.52 per cent to $5,232.97 million in April-June 2015 from $5,658.26 million in the same quarter last year. “Silver jewellery exports have witnessed a sharp increase in the last few years due to rising overseas demand,” said Vipul Shah, chairman, GJEPC. Indian jewellery manufacturers have invested in technology, a neglected area until recently. Being dominated by unorganised sector players, the quantum of investment and technology tie-ups was not known. But the industry estimates investment worth crores of rupees in the last few years. “Silver jewellery manufacturing needs volume, which was not there until recently. With India offering world-class ornaments, orders are now flowing in. "These orders were earlier going to manufacturers in Italy and other countries,” said Rahul Mehta, managing director of Silver Emporium, a Zaveri Bazaar-based silver artifact manufacturer that set up a new unit recently. “The cost of manufacturing is at least 30-40 per cent lower here. India now has world-class technology and a labour cost advantage. With this we see exports growing in the future,” said Mehta. A Thomson Reuters GFMS report estimates world silver jewellery demand grew a staggering 47 per cent to 215.2 million oz (6,693 tonnes) in 2014, thanks to strong performance in India. Demand for silver jewellery, mostly fashion ornaments, is coming to India not only from the US but also from Europe and West Asia. The GFMS report said silver extended its popularity in the jewellery and silverware markets as fashion turned to bigger and heavier pieces. Falling silver prices contributed significantly to the rise in global jewellery demand. Silver averaged $19.07 an oz in 2014, a decline of 19.8 per cent from the previous year.